Today we’re going to dive into a new ironSoap feature meant to help spread the word about new or upcoming books by digging in a little with the authors or contributors on some key storytelling aspects: world-building, character, and editing. 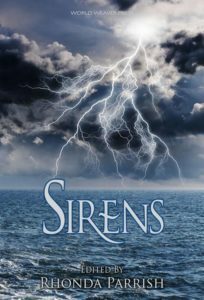 Since this is the first such feature—for fantasy anthology Sirens—we have all three being discussed by different contributors to the project. Sounds great, right? Now let’s check in with a few of the contributors to hear their thoughts on some of those elements of storycraft. Describe your protagonist or antagonist for us. Jordan’s a young man about 26 or so, and he’s just been released from the hospital following a failed suicide attempt. Ordinarily he’s a quiet, sensible, straightforward fellow, but during Notefisher he’s withdrawn and also a little reckless. He’s usually more careful than to take drugs with strangers at a music festival. A long time ago, he used to paint, but now he identifies mostly with his job. What makes them the right character for this particular story? I read (on wikipedia, a testament to my scholarship), that the siren was once called “The Muse of the Lower World”, and I got to wondering, what kind of art does the Muse of the Lower World inspire? What kind of artist? So, Jordan’s there because he’s desperate and this siren feeds off that. How far did you have to go in order to understand this character? What is it they want throughout the story? Just between us, not very far. I’ve got my own mental health struggles, though they’ve never pushed me quite as far as he’s gone, and I’ve definitely spent some summers making dubstep mistakes in the woods. Jordan’s main goal is to find somewhere he belongs. That’s why he came out to the festival in the first place; because it seemed so far removed from the world he’d already decided he didn’t fit into. This is his attempt at visiting an alien world and making a life there. Of course, his mental state makes that very difficult, even though he makes a friend right away. If you replaced this character with someone from another popular story, how would it change the outcome or the plot? Oh, a lot, I imagine! Jordan makes some bad choices because he just doesn’t care anymore. A character who’s still invested in their own life might not even take the drug that allows the siren to appear in the first place! Having said that, I think everyone who has art in them also has a little desperation. (I may just be speaking from my own experience.) I think it’s that desperation that draws us to the siren instead of to the proper muse, so other artistic characters, while their plots would be different, may still encounter her out there. Who would you cast in the role of this character in a film adaptation? Why would they be the best choice? Challenging question! I think someone like Elijah Wood or Daniel Radcliffe, someone who can portray “hollow” effectively. It would be important to find an actor who can go about his business while still having largely given up. But actors are artists, so maybe there are a lot of other actors who know the desperation I’m talking about, too! Describe your revision process a little. How many revisions did you make before it was done? The Dolphin Riders went through four major revisions and I don’t recall how many minor ones. I tend to crank out a draft by brute force sometimes and massage it with many tiny touches later, then move on to a new draft if I want to explore another angle or cure broken aspects that massaging won’t. What’s the most interesting part that appears in the final version that was not present in the first draft? The most interesting part added to the final draft, to me, was having the protagonist Roberto mouth the last six lines of Alfred, Lord Tennyson’s epic poem Ulysses at the end of the story. That fragment just seemed to sum up what I felt when I inserted myself into the tale as an unacknowledged character. Tell us about the one thing you had to change, revise or remove completely that was hardest to let go of. Heh… this one did wind up being tough! I had included a reference to very real, mysterious skeletons found many years ago on Malta. Cutting it out was indeed painful. Why did it have to be cut? The editor, Rhonda Parrish, found it to be a distraction, an assessment that came out of the blue for me. She questioned how the protagonist would know of their existence, and felt it to be too much for a work this short. That made me have to do some deep thinking about what story I was trying to tell… which was an uncomfortable experience seeing as how I was on the fourth draft! I thought I had things nailed down by that point. Why was killing that particular darling difficult? Killing the Malta darling was difficult because it underpinned the original story. I wanted to tantalize the reader with something as weird as the existence of merfolk, and at the same time ground the story. My fictional theory for The Dolphin Readers was that the weird Maltese skeletons, possessing naturally-elongated skulls, were slaughtered merfolk from ages ago. I wanted to hammer home the ancient enmity between the two hominid species, give the skeptical characters a connection to something they didn’t believe in and thus a connection to the reader. I wanted readers to emphathize with the castaways but at the same time be reminded of our dark history when it comes to indigenous peoples. Removing the Maltese references felt at first as if I was betraying the story, the characters, and even myself. But in the end we arrived at a compromise I feel good about, and I’ll delve into the Malta bits in a related, longer work. How similar is the world in your story/book to Earth as we know it? In some ways it’s exactly the same—atmosphere, gravity, weather patterns, land formations, and so on. The big differences are in the realms of magic and zoology, which I think is pretty common for fantasy. I may have made a mistake when I decided to invent all sorts of new animals for this world, but it’s been lots of fun looking for inspiration and trying to draw little fluffy cat­like things—or, in the case of Threshold, big scary winged wolf­like things. What is the coolest or most interesting thing about the world you created in this story/book? The thing I think is coolest is a spoiler. Heh, whoops. But the most obvious cool thing is that the characters live inside giant magical domes which protect them from everything outside, including monsters which want to eat them and magic­based “radiation” from a long­ ago disaster. What did you have to learn in order to create this world? So far most of what I’ve had to learn has been pretty basic. For example, how to create the proper conditions for a desert, or whether it’s possible for Country X to have snowy winters and still grow coffee beans in the summer. The magic aspects didn’t require learning so much as coming up with a system that was consistent. However, once I came up with the “magic radiation” idea, I started researching nuclear disasters, especially Chernobyl and the Red Forest. Fascinating and extremely sad at the same time. How does the setting influence the plot or characters in the story/book? Where would a movie director have to go in order to film an adaptation of this story/book? I’m thinking Badlands National Park would make a great setting, and it’d be extra awesome at night. And I get to go along to consult on the filming, right? Right?